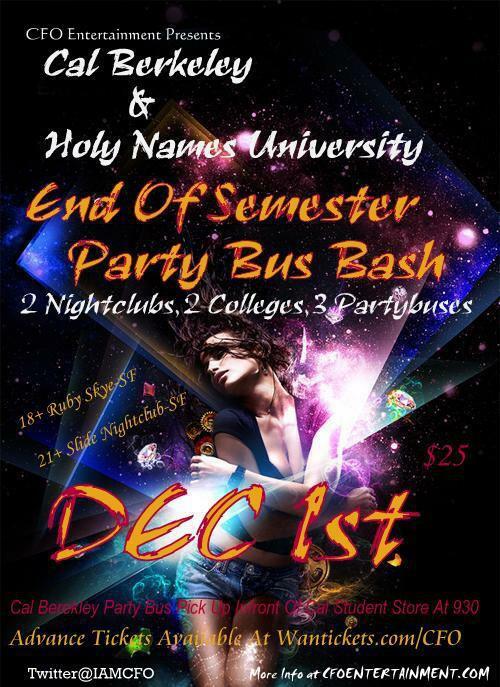 Party Buses will be invading Bay Area Campuses over the next several months..UC Davis, Menlo, Holy Names University, Cal Berkley, SJSU, Dominican and Santa Clara are all on getting a taste of the CFO Nightlife experience.. There are two types of buses that will be accessible by the students…18plus bus and an 21plus bus…the two buses will be going to different venues in the SF area..on certain dates 18plus and 21plus will be combined onto one bus and going to the same venue when demand asks for it. For the 21plus crowd CFO Entertainment will be providing Free entry into one of the hottest nightclubs in SF…Slide NightClub is San Francisco’s finest lounge and private events venue. Slide is a San Francisco nightclub, San Francisco bar and San Francisco corporate events venue. Slide is modern and sophisticated but is also reminiscent of the age of gangsters, flappers and bootleg revelry of years past. Outfitted in over 8,000 square feet of mahogany, Slide features a honey-onyx backlit bar, custom brown and blue hardwood floors, pillowed porcelain bathroom walls and copper accents. Booth seating in chocolate brown and baby blue are available for Bottle Service. Prices are set low for the college student at $25…for all 21 n over students..your ticket will include free entry into Slide nightclub! For 18 n over your ticket will include a reduced rate at the featured nightclub!